Zaire-Rwanda border region. Hundreds of thousands of mainly Hutu refugees stream out of a refugee camp in eastern Zaire, heading home to Rwanda in November © AP/Wide World Photos. 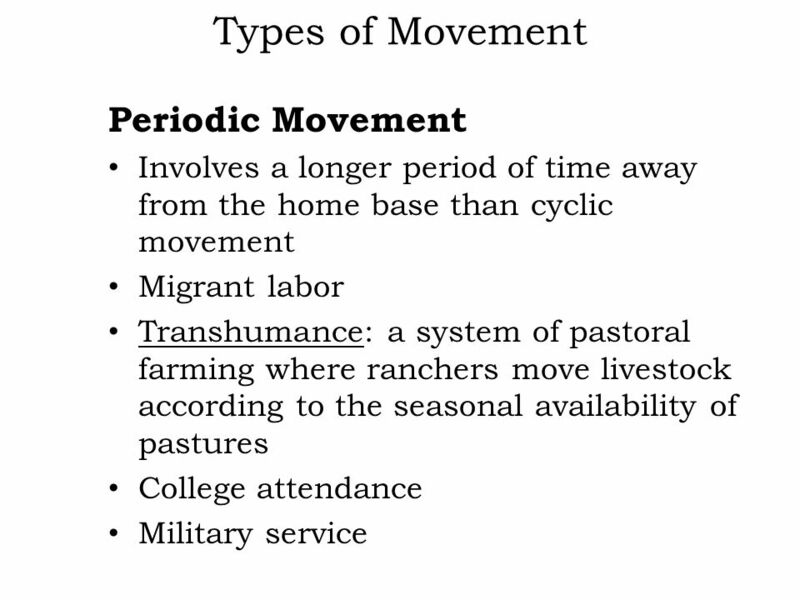 3 Migration Cyclic Movement Movement is inherently geographical. 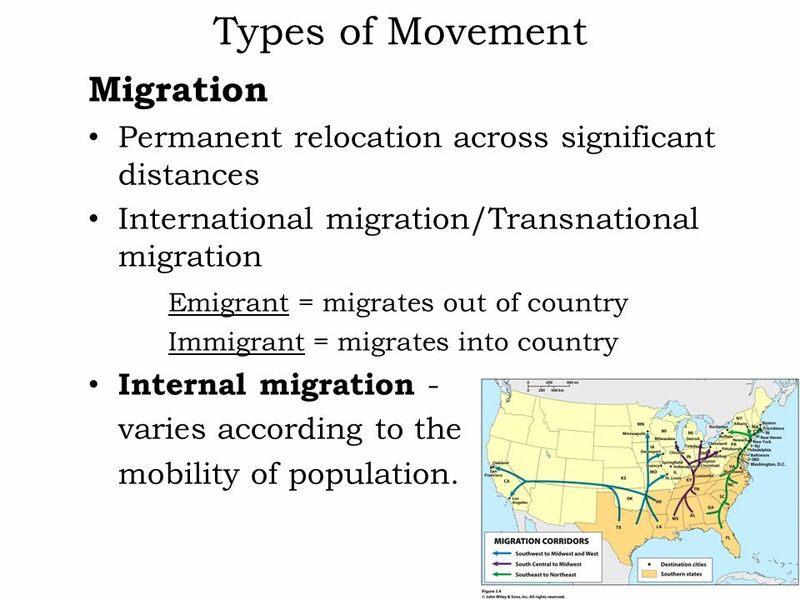 Permanent relocation across significant distances International migration/Transnational migration Emigrant = migrates out of country Immigrant = migrates into country Internal migration - varies according to the mobility of population. Atlantic slave trade: the largest and most devastating forced migration in the history of humanity Forced migration still happens today. 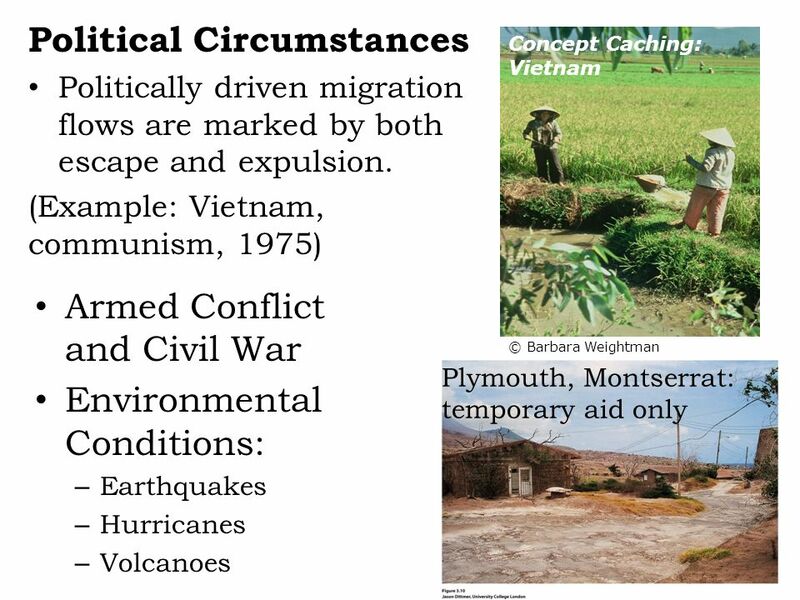 Example: countermigration -governments detain migrants who enter illegally and return to home countries. 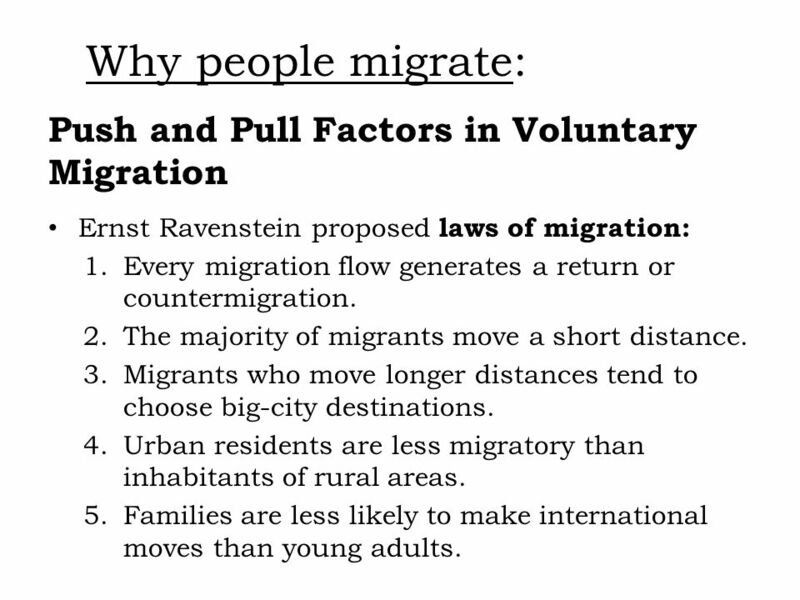 Why people migrate: Push and Pull Factors in Voluntary Migration Ernst Ravenstein proposed laws of migration: Every migration flow generates a return or countermigration. The majority of migrants move a short distance. Migrants who move longer distances tend to choose big-city destinations. Urban residents are less migratory than inhabitants of rural areas. Families are less likely to make international moves than young adults. 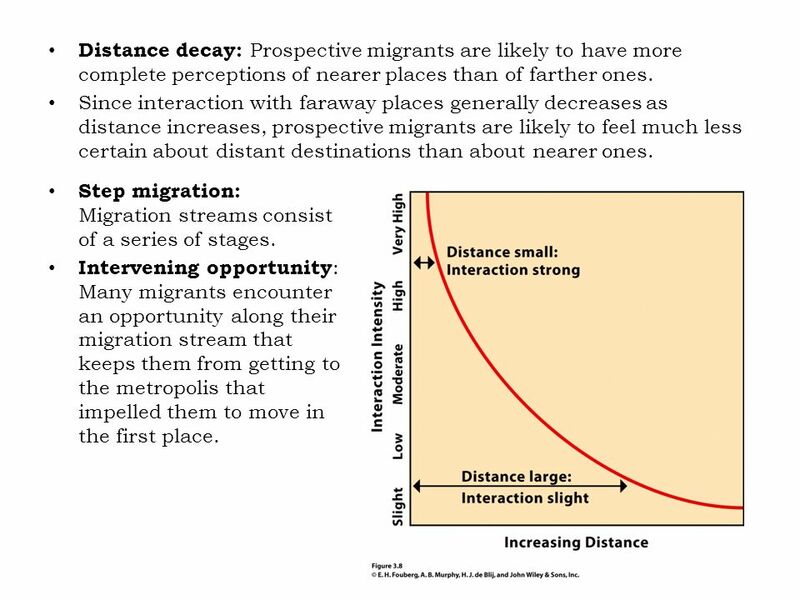 11 Distance decay: Prospective migrants are likely to have more complete perceptions of nearer places than of farther ones. Since interaction with faraway places generally decreases as distance increases, prospective migrants are likely to feel much less certain about distant destinations than about nearer ones. 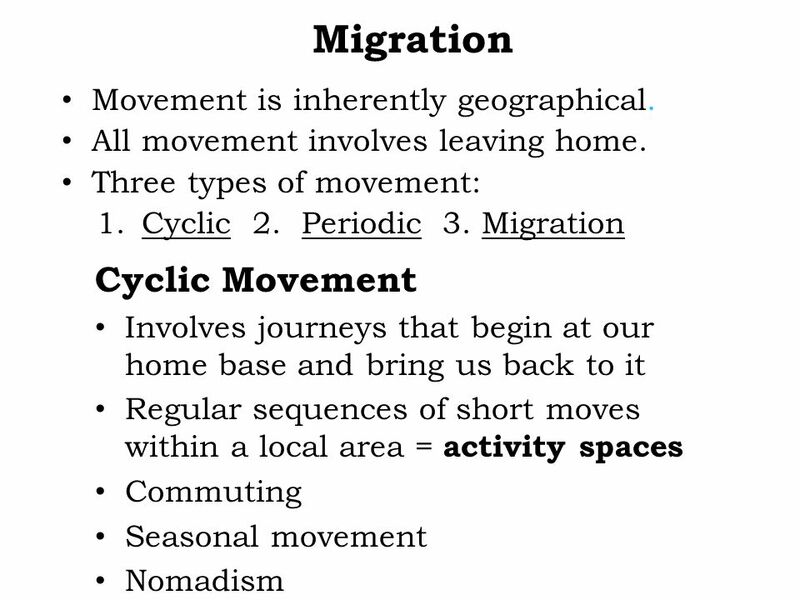 Step migration: Migration streams consist of a series of stages. 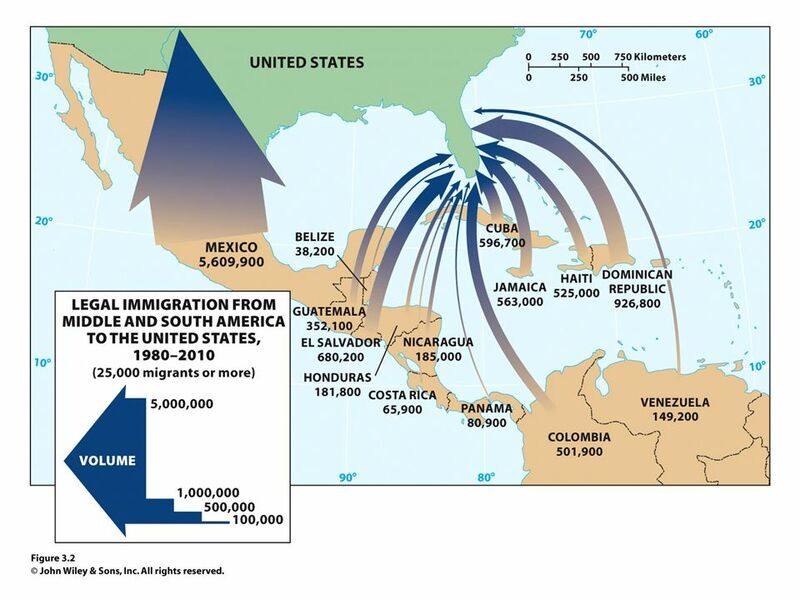 Intervening opportunity: Many migrants encounter an opportunity along their migration stream that keeps them from getting to the metropolis that impelled them to move in the first place. Legal status: Migrants can arrive in a country with or without consent of the host country. Economic conditions: Poverty has driven countless millions from their homelands. Power relationships: Power relationships already embedded in society enable the flow of migrants around the world. 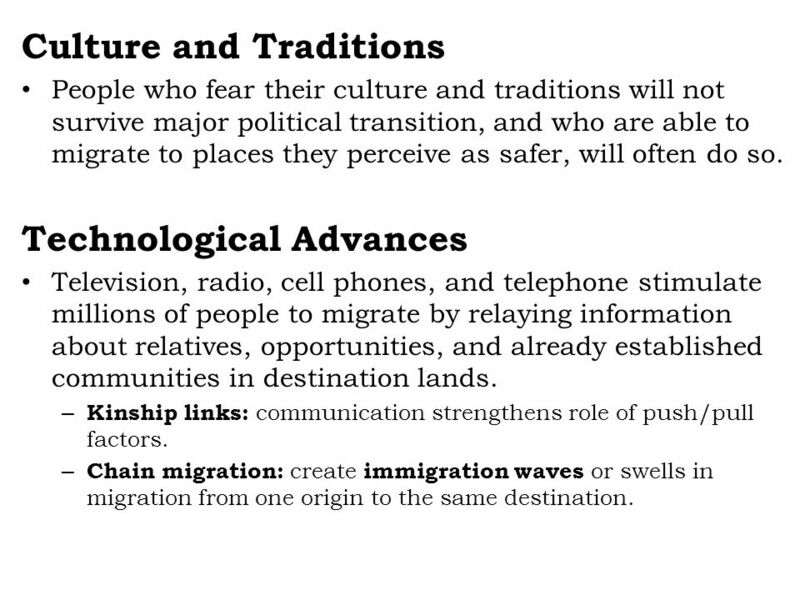 People who fear their culture and traditions will not survive major political transition, and who are able to migrate to places they perceive as safer, will often do so. Technological Advances Television, radio, cell phones, and telephone stimulate millions of people to migrate by relaying information about relatives, opportunities, and already established communities in destination lands. Kinship links: communication strengthens role of push/pull factors. 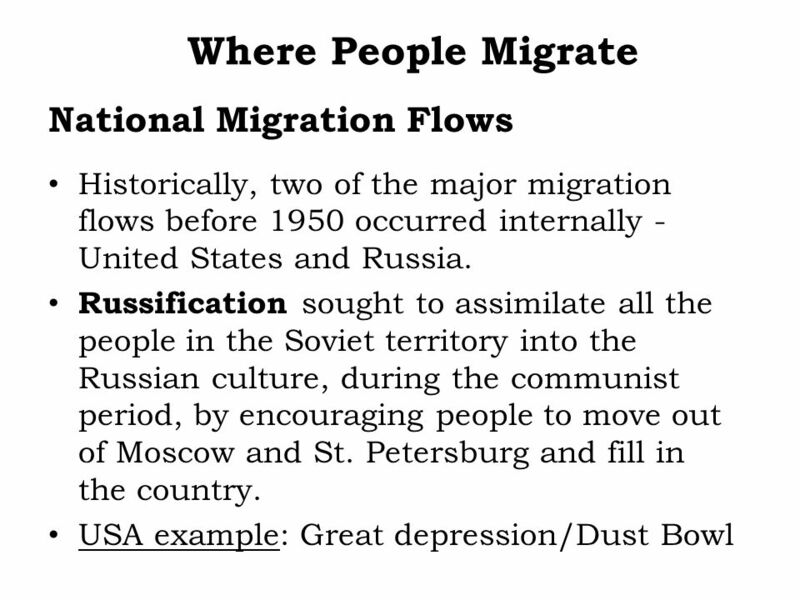 Chain migration: create immigration waves or swells in migration from one origin to the same destination. 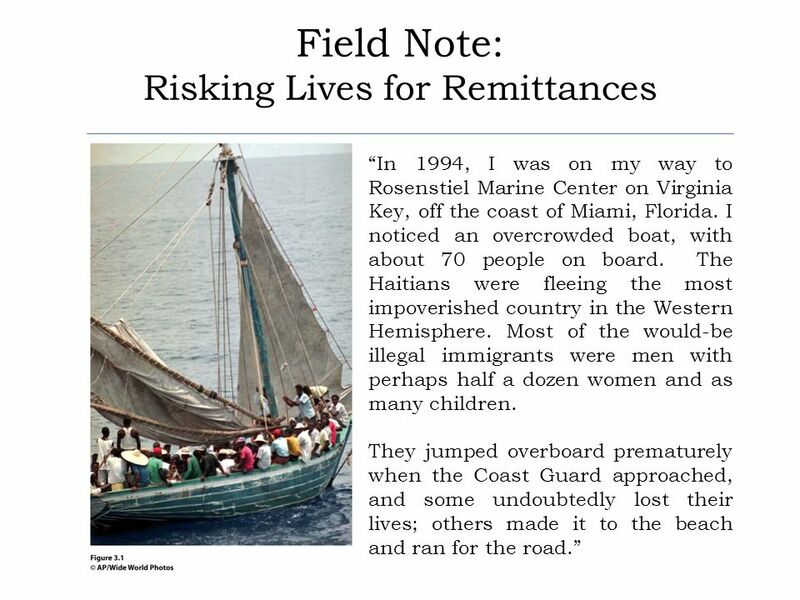 Millions of guest workers live outside of their home country and send remittances from their jobs home ($ to family). Their home states are fully aware that their citizens have visas and are working abroad. Despite the legal status of guest workers, many employers abuse them because guest workers are often unaware of their rights. 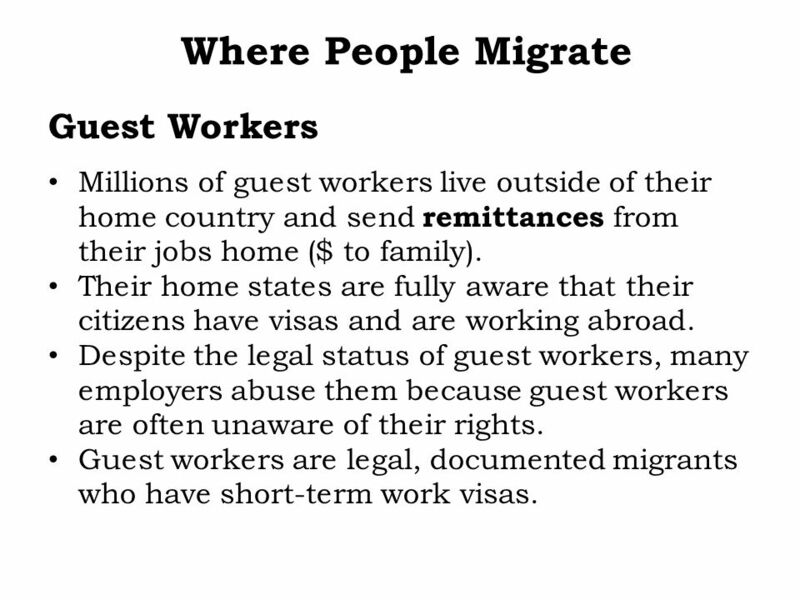 Guest workers are legal, documented migrants who have short-term work visas. Refugee: “a person who has a wellfounded fear of being persecuted for reasons of race, religion, nationality, membership of a particular social group, or political opinion.” UN estimates 83% of refugees flee to a country in the same region as their home. 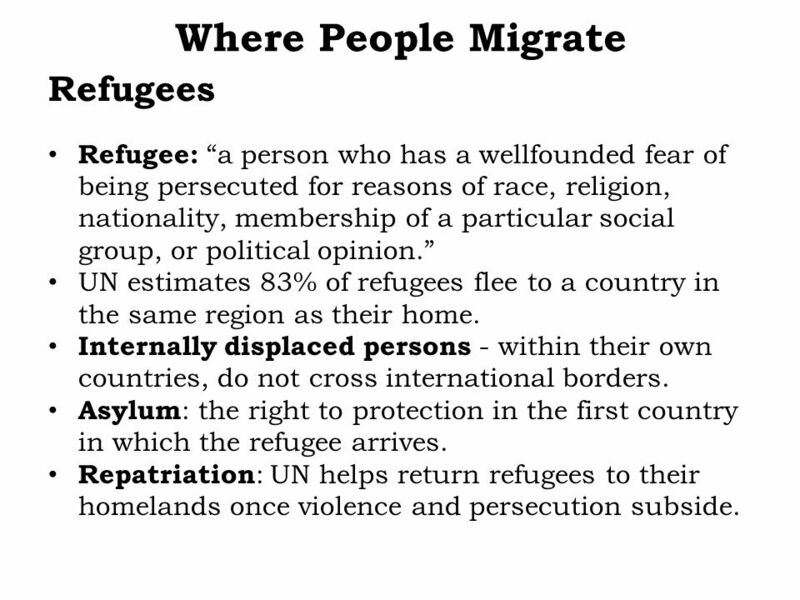 Internally displaced persons - within their own countries, do not cross international borders. Asylum: the right to protection in the first country in which the refugee arrives. Repatriation: UN helps return refugees to their homelands once violence and persecution subside. 21 Figure 3.17 Zaire-Rwanda border region. 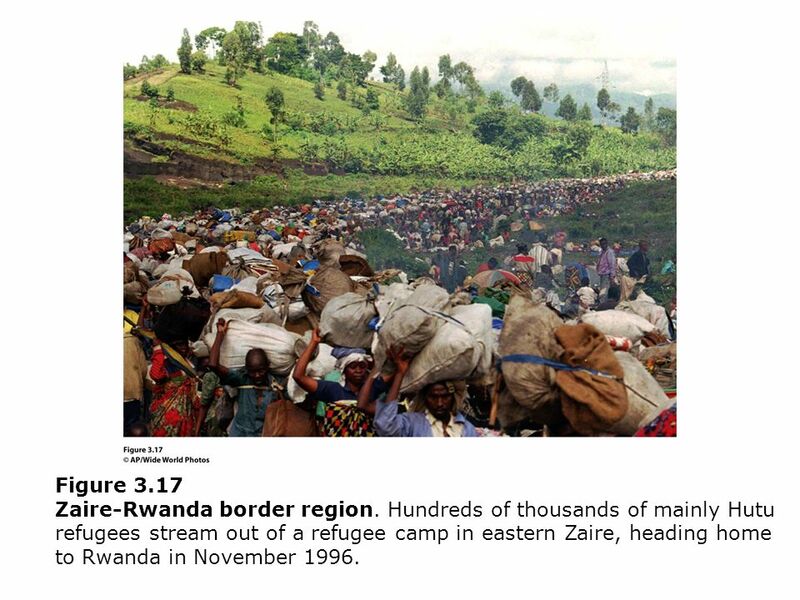 Hundreds of thousands of mainly Hutu refugees stream out of a refugee camp in eastern Zaire, heading home to Rwanda in November 1996. 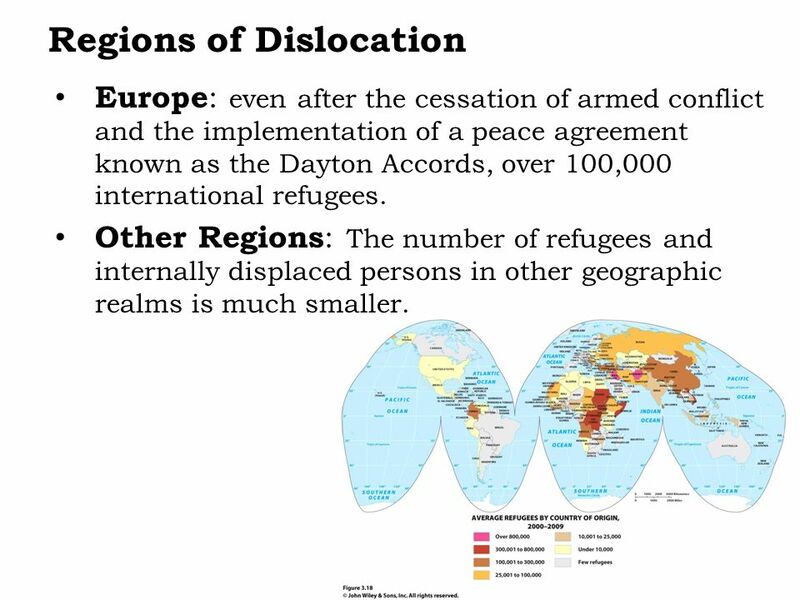 Europe: even after the cessation of armed conflict and the implementation of a peace agreement known as the Dayton Accords, over 100,000 international refugees. 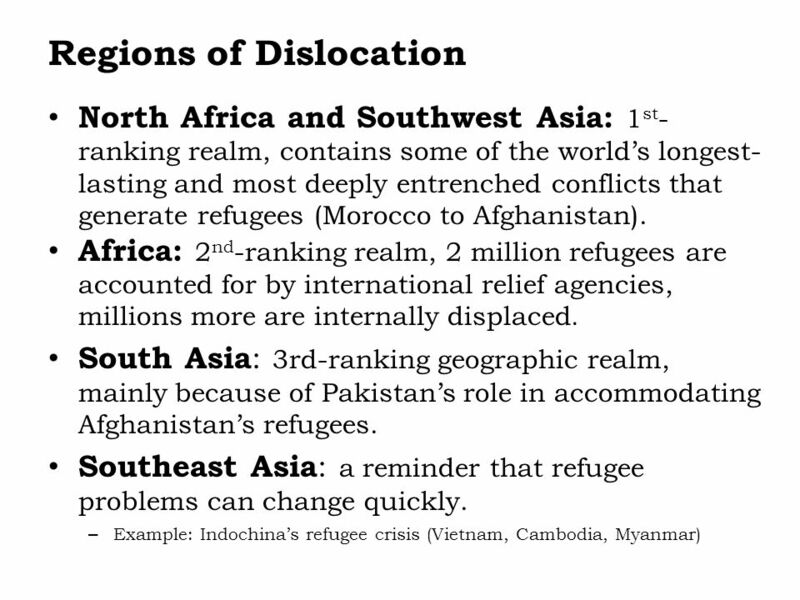 Other Regions: The number of refugees and internally displaced persons in other geographic realms is much smaller. 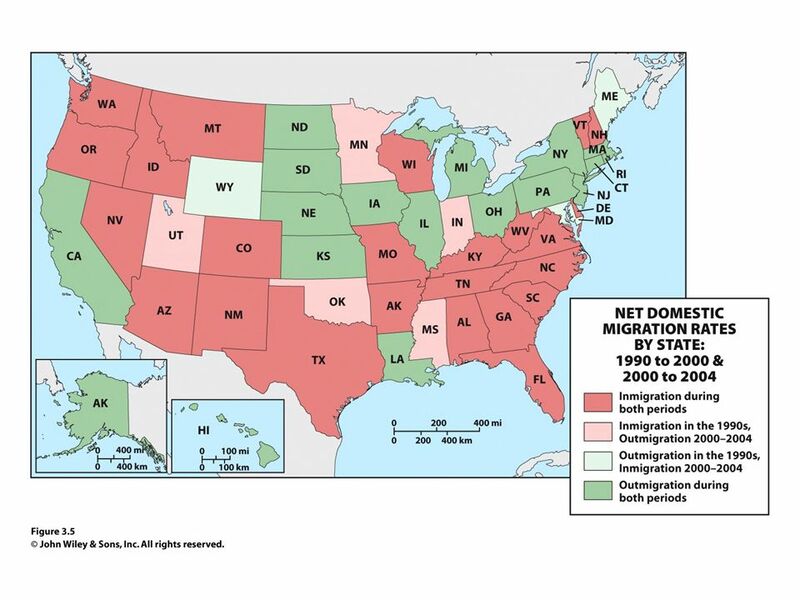 Immigration Waves in the United States Immigration high, a great wave today. Immigration quotas: number of people allowed in, unequal by country/culture. 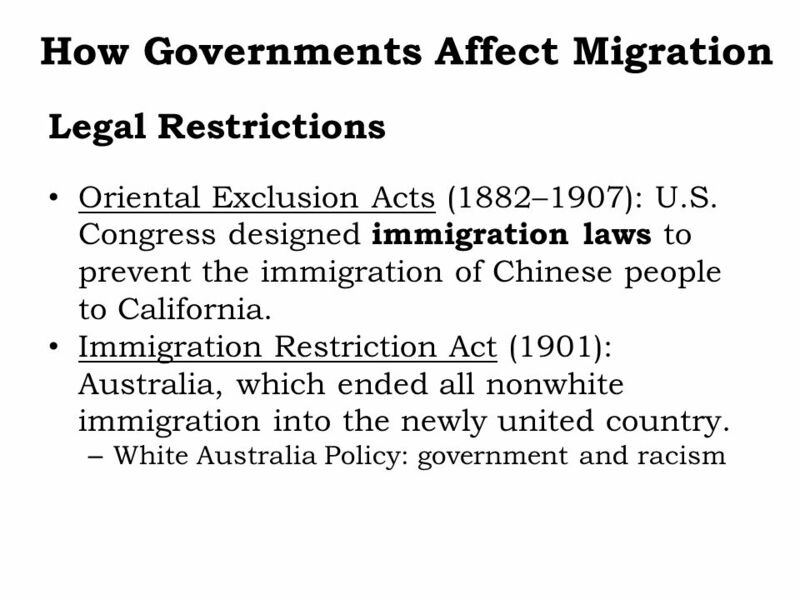 National Origins Law in 1929: 150,000 per year limit into USA. 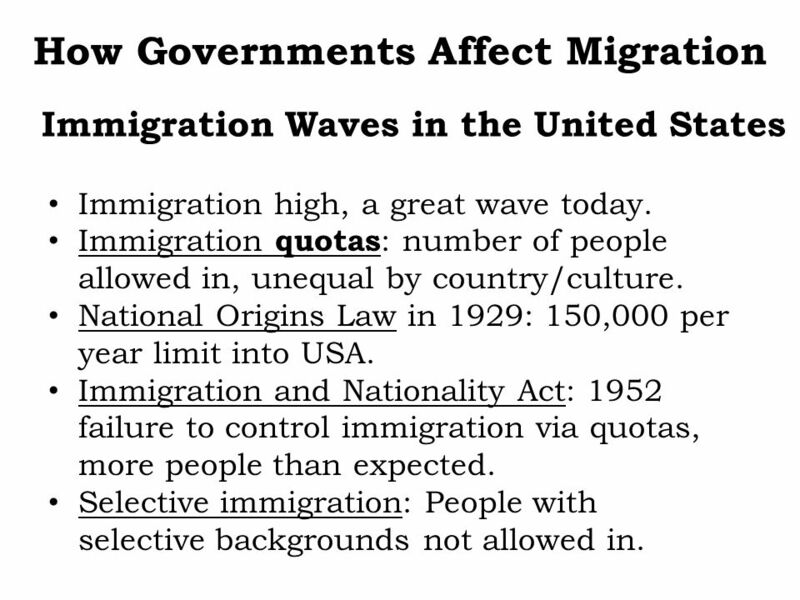 Immigration and Nationality Act: 1952 failure to control immigration via quotas, more people than expected. Selective immigration: People with selective backgrounds not allowed in. 26 USA/Post–September 11 New government policies affect asylum-seekers, illegal immigrants, and legal immigrants. 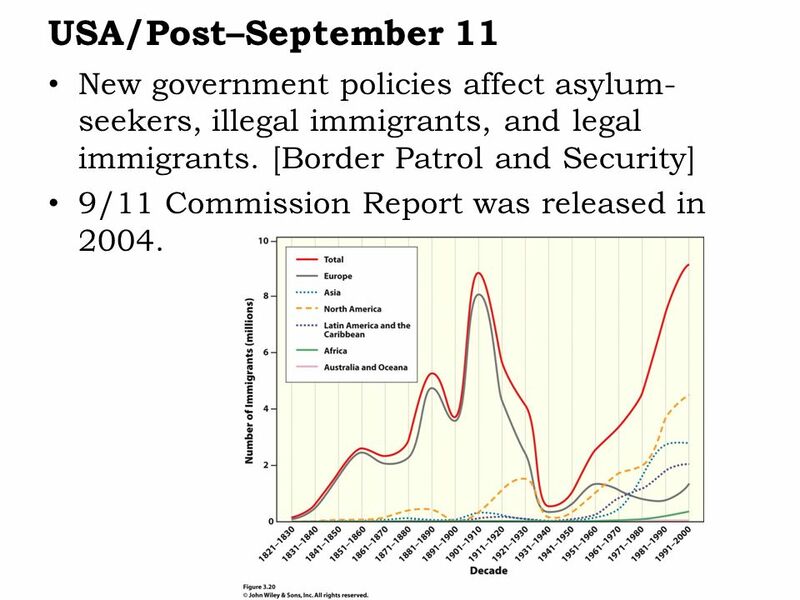 [Border Patrol and Security] 9/11 Commission Report was released in 2004. 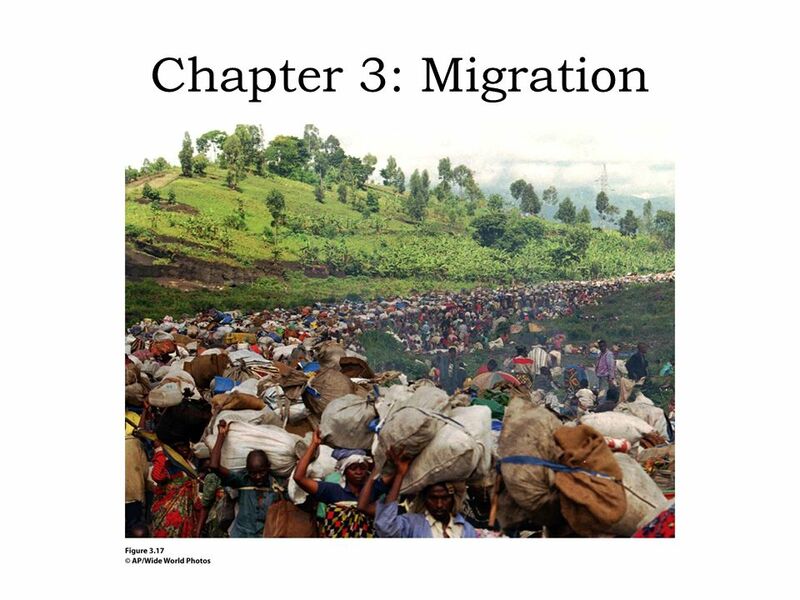 Download ppt "Chapter 3: Migration Figure 3.17"
© 2012 John Wiley & Sons, Inc. All rights reserved. HUMANS ON THE MOVE MIGRATION. 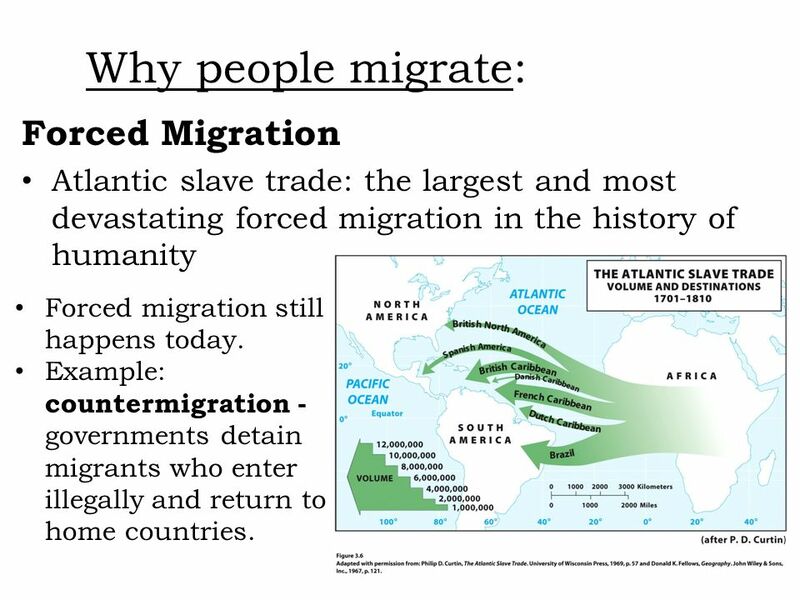 What is Migration? September 30, Migration The movement of people from one place to another – Movement speeds the diffusion of ideas and innovations. MIGRATION & LANGUAGE: A GEOGRAPHIC INTRODUCTION. Perception and Migration Distance and direction perceptions Absolute and relative distance Absolute distance. 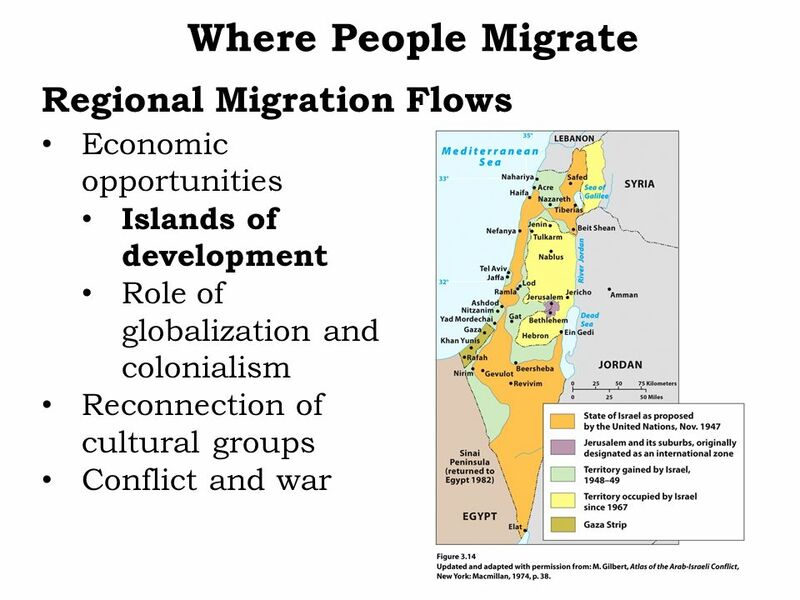 WORLD GEOGRAPHY Sept. 23, Today Migration (part 1) - Background - Migration defined - Reasons for migration - Where are people going? - Government. Chapter 3 Migration. Key Terms  Mobility: movements from one place to another  Migration: permanent move to a new location  Emigration: migration from. 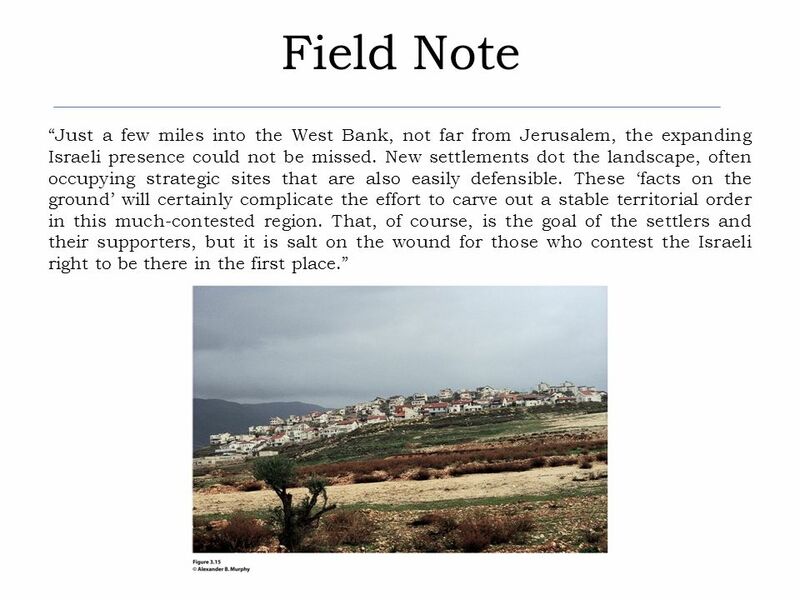 © 2011 Pearson Education, Inc. Chapter 3: Migration The Cultural Landscape: An Introduction to Human Geography. 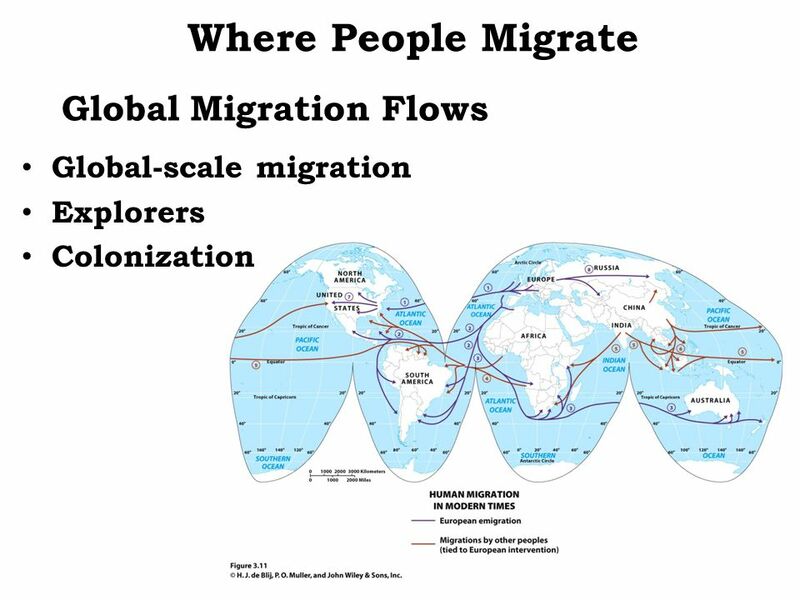 Migration Intro to Human Geography Harpweek.com. © 2011 Pearson Education, Inc. Objectives Introduce relevant migration terminology Consider the role.